To walk the Earth, she must feed her hollow soul. Some of the most beautiful people in the world are not human. They have no souls, feel no emotion, and are pure evil. You can tell by the color of their dark, dead eyes. Samuel Glaus knows this. He is the son of a human mother and soulless father. He is, after all, half human and a hunter of the soulless. He is also in love with one who cannot love him back. Thalya is a soulless creature, but unlike others of her kind, she does not kill to feed her hollow soul. She hungers only for emotion, and, above all, she hungers for Samuel's love. Her enemy. Her redemption. And she's willing to kill for it. This was a refreshing read full of originality. I've read my fair share of vampire books. This was the first one, (for me at least) that put a new spin on their lore. The characters were all likable, the story original, and didn't feel like something I've read a hundred times before. The story has everything to do with falling angels and how they somehow find redemption. The thing is they don't know they are falling angels. I don't want to give away key plot points but some of the characters are from the bible, like Adam. I found it an interesting take on the lore of vampires but it still managed to be respectful to the bible and angels. I only took off a star for the Performance. I thought the heroine sounded a bit one dimensional and the way I would imagine Bela Lugosi to sound in drag if he were playing a female vampire. His other female voices sounded like old women to me, even the one that was younger. His male voices were great and he reads nicely. I just found the female voices distracting. Overall, I think you can't go wrong giving this a listen. I was pleasantly surprised. This was an excellent book. It was full of action, romance, and of course skin on skin time ;) It most definitely isn't the usual blood-sucking vamps from hell or an uber romantic vamp novel (been though I love those too). Thalya and Samuel were well written and I loved the fact that even though they were opposites, their differences made them perfect for each other. I do wish that more was said about how Chris and Cain were caught and dealt with though. Just knowing that they were caught just wasn't as satisfying without knowing the how. All in all, I enjoyed this story. The narrator was pretty good and allowed the story to flow well and draw me in. The soulless need love too! What made the experience of listening to Angel Rising the most enjoyable? I loved the initial meeting between Samuel and Thalya. They were so intrigued by each other and trying to figure out if they could trust on another while fighting the attraction they felt for each other. What was one of the most memorable moments of Angel Rising? If you love a little action with your romance, then you're going to love the fighting scenes. What about Ron Herczig’s performance did you like? The narrator, Ron Herczig, made the story that much more enjoyable. His reading style made you feel the emotion behind the characters words. If I had the time, I definitely could have finished the book in one sitting. A whole new take on the world of vampires. This audiobook was provided by the author at no cost in exchange for an unbiased review courtesy of Audiobook Blast. A totally different take on the world of vampires and those who hunt them. 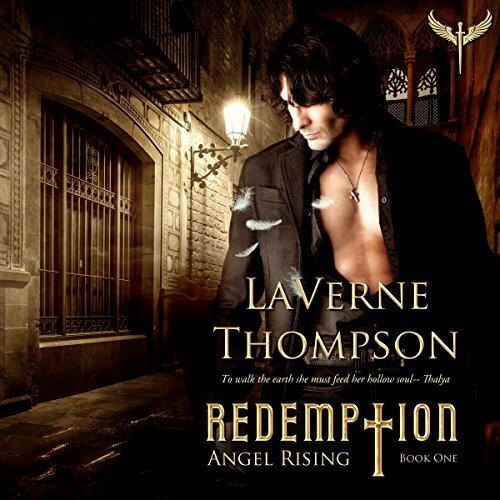 In LaVerne Thompson’s world vampires are beautiful, but soulless, creatures who need their victims’ emotions, rather than their blood, always trying to recapture their lost souls. Oh, there are some who feed on blood also but they do so out of cruelty, not because the blood sustains them. The hunters believe that all vampires are blood suckers and killers, and the whole purpose of the hunters’ life is to eliminate all vampires from the world. Samuel is a hunter of unusual descent. His father was vampire while his mother was a human. Because of his mixed heritage, Samuel draws powers from both of his parents. He is able to sense other vampires through his father’s blood, but he also has a soul and harbors all of the human emotions. He is the leader of the Vampire Hunters. Thalya is vampire, she is not a blood sucker, but feeds on the emotion of depression to keep her alive. One evening she encounters Samuel’s very handsome nephew, Carl, who is severely depressed. Thalya strikes up a conversation and gets close to Carl ending their evening with a kiss. Carl returns home in much better spirits and Thalya has rejuvenated herself. Witnessing the encounter between Thalya and Carl, Samuel is curious as to why Thalya did not even attempt to take Carl’s blood. He follows, and arranges to meet her, to try to discover what her motives are and then to rid the world of her. Samuel will soon find his beliefs challenged to their limits and will begin to question everything he has ever thought, or felt, about the soulless. So begins one of the most interesting vampire stories I have read (listened to) in quite some time. I would have liked to hear a little more emotion from the narrator, but the characters and storyline in this book are strong and draw you in immediately. The further into the story you get the stronger and more intriguing it becomes. There are twists and turns and character introductions that will floor you throughout the book. You will succumb to all the emotions that the soulless are bereft of, love, hate, sadness, joy, and redemption. A great introduction to this series. I look forward to reading much, much more.